Agritourism plays an important role for sustainable development, acting as integrator for other economic sectors, like agriculture, transport, services, preserving the traditions and historical heritage. 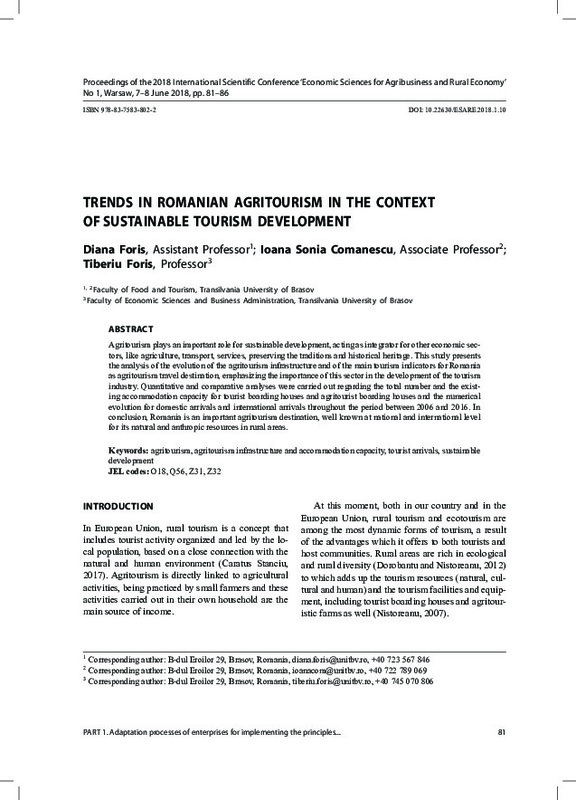 This study presents the analysis of the evolution of the agritourism infrastructure and of the main tourism indicators for Romania as agritourism travel destination, emphasizing the importance of this sector in the development of the tourism industry. Quantitative and comparative analyses were carried out regarding the total number and the existing accommodation capacity for tourist boarding houses and agritourist boarding houses and the numerical evolution for domestic arrivals and international arrivals throughout the period between 2006 and 2016. In conclusion, Romania is an important agritourism destination, well known at national and international level for its natural and anthropic resources in rural areas.